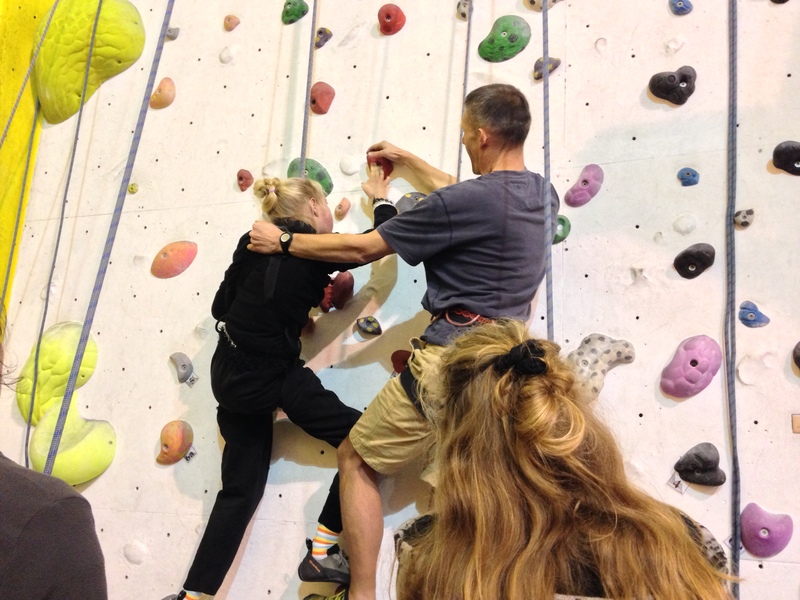 Enthusiasm for strength in climbing …. Clare has tried some strength training in the park. But we have to cancel the 28th September climb. Clare is having a rough time. It’s just a viral cold/cough, but a challenge to anyone without hefty breathing power and a forceful cough. A few days of oxygen, day and night ventilator on raised pressures, and chest physio. “I’m very bored”, Clare tells the respiratory nurse on Day 2 of being stuck at home. “I’m desperate to be out and about”, she tells him after a week at home. “If it wasn’t you, I’d say have another week off school”, he says. 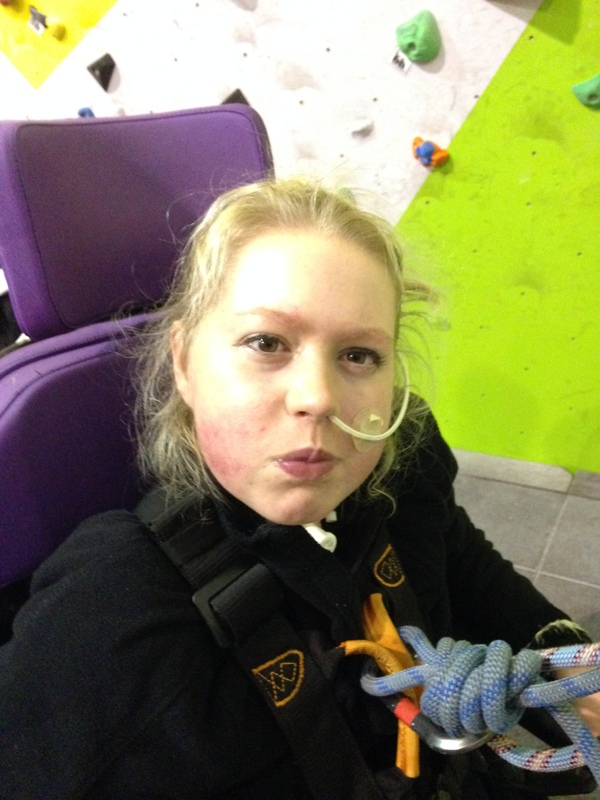 Clare goes back to school, but works on recuperation for another week before climbing. Back at last! A Sunday afternoon – we meet Robin on arrival, in colourful cycling top after bike ride with friends and cycling over to the Foundry. Nick and Helen are over at the Slab, also Hazel. 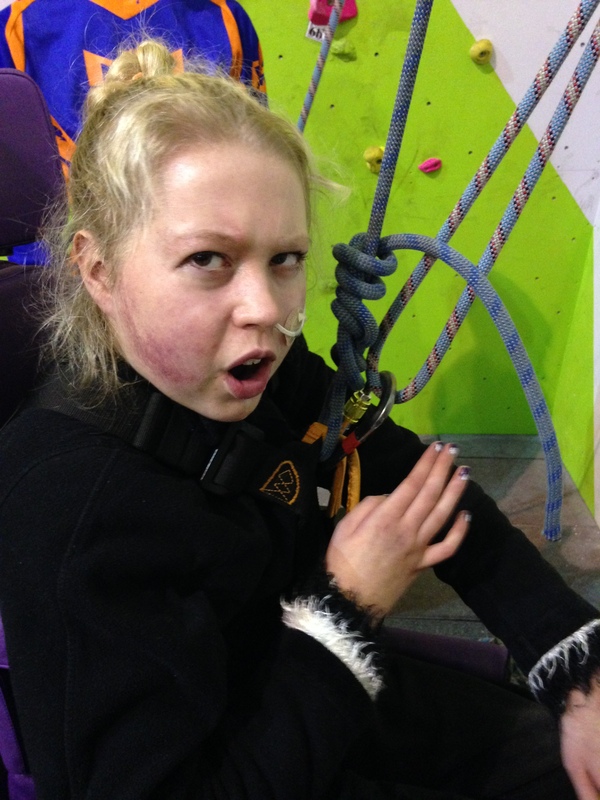 The hot news is the plan for a climbing club for young people with disabilities. Nick mailed us about it yesterday after a meeting at The Foundry. 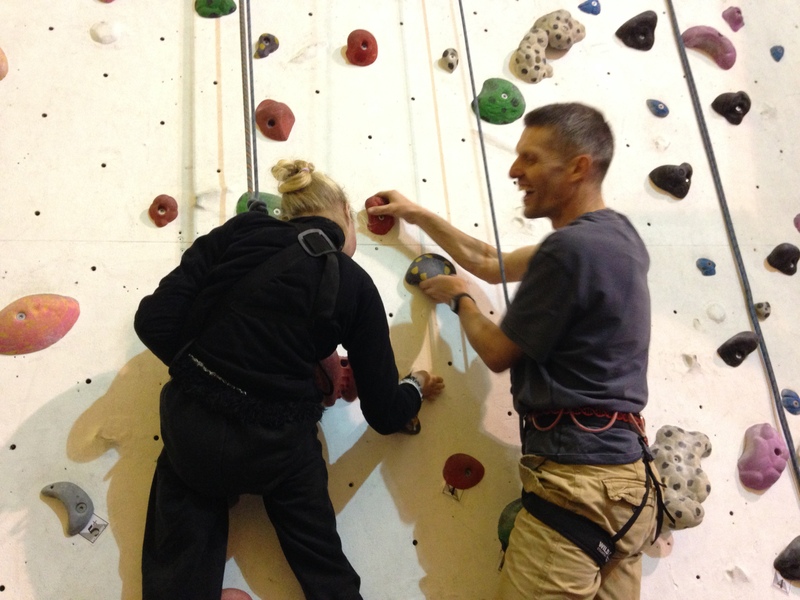 Training up some instructors, buying specialist kit for assisted climbing – yay! it’s really happening! So pleased that Clare and I have been a part of it, even just to be on the receiving end. As we start to get ready I decide it’s a good opportunity to speak to Hazel, after using her stuff for weeks. “Thanks for letting Clare use all your stuff!” I say sincerely. Hazel looks blank. Ooops. She didn’t know?! Robin and Nick and Helen are making jokes and laughing. I feel sheepish but Hazel seems OK about things. Everyone else is good. Nick has been for a 2 hour run today – because of his ankle, he explains. “Err…is a 2-hour run good on an injured ankle?” Apparently so. One ankle is visibly wider than the other but “not a problem”. The first climb – with Robin. Hazel belayed Robin, and Nick & Helen did ropes for Clare. It’s a thoughtful and steady climb, using both hands and feet. A strong and sustained effort. Robin lets the team know when Clare wants to come down. As she’s lowered into her chair there are at least 3 of us scrutinising her face for signs of over-tiredness. Nick says there’s a certain kind of tiredess you get from climbing and describes it …I get the impression of fatigue deep in the muscles. Hazel sets out to climb using just dalmations. Robin climbs the corner chimney to the left of the Slab. Enjoyable spectating. Nick is climbing with Clare now, Robin belaying. Clare is reaching to position her hands and Nick is getting her to look down at her feet. Third climb. I wasn’t sure Clare would want a third climb. She looks well-oxygenated but cold. Still a ninja. Nick suggests she tries just two moves on this last effort, aiming to get both hands together around big red holds. One more pull… achieved. Hah! Coffees. Check Helen’s busy diary. See you in 2 weeks. Hyor!! !